Aaron is a important leader of Alexandria Safe Zone who initially acts the groups recruiter. Over time he becomes one of Rick's trusted advisers. Aaron in the bible is the brother of Moses. Despite the major differences between the two brothers they love and trust each other. Aaron name is often used to describe brotherly love. Aaron is a recruiter for the Alexandria Safe-Zone. He goes out with his partner Eric who is also his boyfriend. He watches groups in secret and if he feels they are good people recruits them. He recruits by revealing himself and talking to them without weapons. His partner Eric listens from a nearby location and is ready to intervene should the groups attempt to attack Aaron. Once he recruits them he brings the groups to Alexandria Safe-Zone where Douglas Monroe makes the final decision whether they should be invited into the group. 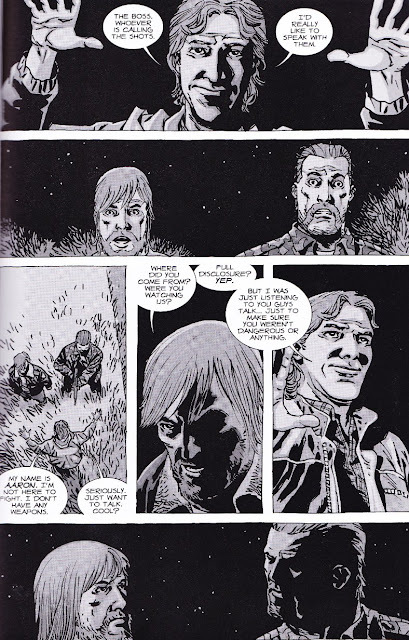 Aaron approaches Rick and Abraham Ford to recruit them. Rick knocks Aaron out as he does not trust him. Michonne tells Rick that Aaron is nothing like the Governor and can be trusted. Aaron then proves himself by helping fight off some zombies. A flare goes off from a supply crew of the Alexandria Safe Zone and the whole group rushes to help them. He brings the group to Alexandria Safe Zone where they join the group. Eric and Aaron decide to stop going out into the world after Eric is stabbed by a horse thief. The pair are trapped in their when a massive horde invades Alexandria Safe-Zone. Aaron and Eric join Rick and Michonne as they battle a massive herd of walkers. Aaron advises Rick to trust Paul the recruiter from Hilltop. While Rick is still reluctant to trust new people Aaron reminds Rick that he and the people of Alexandria turned out to be ok. The battle with the Saviors encompasses the community. Eric thinks the couple should leave and fend for themselves. Aaron argues they must stay and help. The two join Rick's strike force and attack a Savior base. During the battle Eric is shot through the head by sniper. Aaron is momentarily grief stricken but reenters the battle. Aaron mourns his lover Eric but continues fighting. He takes part in the battle of Hilltop. He rushes and helps Rick when he is shot by a crossbow bolt from Dwight. He also helps in the final battle where Negan is defeated and captured. Aaron is played by actor Ross Marquand. He meets the group at a very low point. They are starving and thirsty and have just lost two of their members. Aaron leaves water bottles for the group but they are mistrustful of them. He then reveals himself and walks out to the group unarmed. He is brought before Rick who still does not trust him. Rick asks him how many men are out there with him. Aaron asks him why it matter what he says.